A. Net present value (NPV). The NPV of an investment is the difference between its market value and its cost. The NPV rule is to take a project if its NPV is positive. NPV is frequently estimated by calculating the present value of the future cash flows (to estimate market value) and then subtracting the cost. 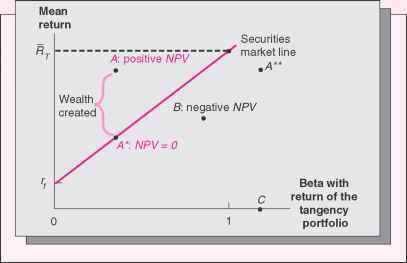 NPV has no serious flaws; it is the preferred decision criterion. B. Internal rate of return (IRR). The IRR is the discount rate that makes the estimated NPV of an investment equal to zero; it is sometimes called the discounted cash flow (DCF) return. The IRR rule is to take a project when its IRR exceeds the required return. IRR is closely related to NPV, and it leads to exactly the same decisions as NPV for conventional, independent projects. When project cash flows are not conventional, there may be no IrR or there may be more than one. More seriously, the IRR cannot be used to rank mutually exclusive projects; the project with the highest IRR is not necessarily the preferred investment. C. Profitability index (PI). The PI, also called the benefit-cost ratio, is the ratio of present value to cost. The PI rule is to take an investment if the index exceeds 1. The PI measures the present value of an investment per dollar invested. It is quite similar to NPV, but, like IRR, it cannot be used to rank mutually exclusive projects. However, it is sometimes used to rank projects when a firm has more positive NPV investments than it can currently finance. A. Payback period. The payback period is the length of time until the sum of an investment's cash flows equals its cost. The payback period rule is to take a project if its payback is less than some cutoff. The payback period is a flawed criterion, primarily because it ignores risk, the time value of money, and cash flows beyond the cutoff point. B. Discounted payback period. The discounted payback period is the length of time until the sum of an investment's discounted cash flows equals its cost. The discounted payback period rule is to take an investment if the discounted payback is less than some cutoff. The discounted payback rule is flawed, primarily because it ignores cash flows after the cutoff. A. Average accounting return (AAR). The AAR is a measure of accounting profit relative to book value. It is not related to the IRR, but it is similar to the accounting return on assets (ROA) measure in Chapter 3. The AAR rule is to take an investment if its AAR exceeds a benchmark AAR. The AAR is seriously flawed for a variety of reasons, and it has little to recommend it.